WEATHER ALERT: CONNECT WITH YOUR SITE LEADER IF RAIN BECOMES A CONCERN. SITE LEADERS HAVE BEEN IN CONTACT WITH NON-PROFITS TO DETERMINE THE BEST WAY TO PROCEED WITH PROJECTS. THANK YOU! 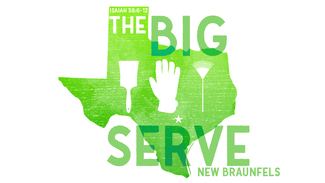 Be the Church as we partner with the local body of believers and head out in unity to serve non-profits and others in need around New Braunfels. This is a great reminder to ourselves that we are the Church, we don't attend one. Current congregations involved include First Protestant, Freedom Fellowship, Hope Presbyterian, NB Presbyterian, NB Church of Christ, Oakwood, Peace Lutheran, River City Church, River City Vineyard, the Springs Community Church, St. John's Episcopal, Tree of Life, and more. All are welcome to join! Site needs vary from painting buildings, breaking down walls and planting flowers, to crocheting homeless mats and writing cards to prisoners. All ages and abilities are welcome! Most volunteer times are from 9am-12pm or 1pm-4pm, but check your site for exact service time. Feel free to sign up for a morning shift and an afternoon shift, if you'd like. Childcare will not be provided. Your kids are welcome to serve alongside you and child-friendly sites are noted. CHILD FRIENDLY. Spring cleaning and flowers planted in garden beds. Volunteers to bring gardening tools. CHILD FRIENDLY. installing/tear down, gardening, organizing storage room/donations, deep cleaning. Volunteers to bring gardening tools/gloves, shovel/wheelbarrow and handyman tools, if possible. I hope to meet and talk about later volunteering as a tutor/mentor with Connections. (Am a Christian, English teacher, and dyslexia/ reading specialist. CHILD FRIENDLY. Organizing, painting, mowing, deep cleaning, some manual labor/assembly. Volunteers to bring work gloves, handyman tools, weed eater, lawn mower, shrub trimming supplies, if possible. CHILD FRIENDLY, but no infants. Painting. CHILD FRIENDLY. Clean up inside and out. Must be 18 or older. Online safety course required. Closed Toed Shoe and bring water. Bring own lunch. Will work rain or shine. Kim, Dixie had initially signed me up for the headwaters site, but I noticed the habitat for humanity only had 9 sign up, so is it too late to switch sites? I can't make it at 10 because of repair coming to the house at 10, too. Will come right over when finished. CHILD FRIENDLY. Planting and weeding. Light trash pick up. Wear closed toed shoes. Bring work gloves and trowels if possible. We will have our littles, ages 6,4, and 2 with us. CHILD FRIENDLY, but must sign release, as working next to river. Spreading mulch. Wear closed toed shoes and pants. Bring work gloves, if possible. CHILD FRIENDLY. Cut, sort, and crochet plastic bags into helpful tools for the homeless. No experience necessary. Myself and my 12 year old son will be there. CHILD FRIENDLY. Prepping store for summer shoppers, sorting donations. CHILD FRIENDLY. Clean up, planting, weeding. CHILD FRIENDLY. Write cards to encourage inmates. We signed up for distribution that afternoon. Is there some way I can do this on an ongoing basis? Are the cards made prior to this date? CHILD FRIENDLY. Distribute Jesus Film Door to Door around New Braunfels. Exact locations given day of. CHILD FRIENDLY. Lawn Care at Senior Homes around town. Address of home given day of. CHILD FRIENDLY. Yard work, tree trimming, mow lawn, light landscaping, power washing. Build and install a ramp at a home for a wheelchair bound individual. Bring a lunch.